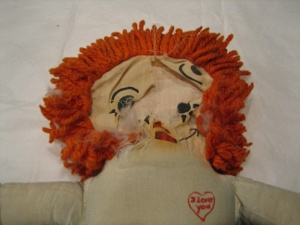 Raggedy Ann and Andy: cloth dolls that can be repaired for your loved one. Do you have a Raggedy Ann or Raggedy Andy? Raggedy Ann and Andy -Years of Production: 1918 through today. 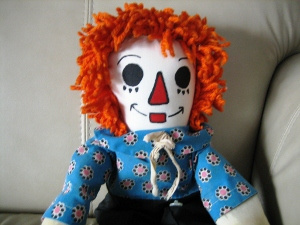 Sizes of Raggedy Ann and Andy Dolls range from miniature (under 6") to 48" and up. Raggedy Ann and Andy have been created in nearly every size imaginable. However, classic, standard sizes of the dolls are from 15" to 18". A much loved Andy. A clean and to be loved forever Andy.